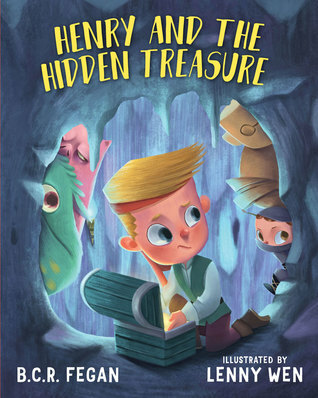 Henry and the Hidden Treasure is the story of one little boy’s quest to keep his treasure a secret from his sister. How did the initial idea for this story come about and how did it evolve as you wrote? Imagination. Secrets. Spies. Treasure. These were all the things that I loved to read about when I was a child, so it made sense that I would incorporate these themes into a picture book sooner or later. Probably the very first thought I had when I set about writing Henry and the Hidden Treasure centered on the idea of treasure. What makes the concept of treasure so appealing to children? From there it wasn’t hard to extend this idea and ask the question: What constitutes real treasure within a family? The story leads the reader on a journey into a child’s imagination and its endless possibilities. What do you hope your readers take away from the story? Exactly that! I try to write every one of my books to encourage imagination. I think the mark of a great picture book is when children go beyond the written narrative and begin to explore the world of the story for themselves. Of course, it’s important to have positive themes and morals, but I try to make them subtle, or at least secondary to the imaginative qualities of the tale. I love the brother vs. sister dynamic in this book. What were the morals you were trying to capture while creating your characters? I think anyone reading Henry and the Hidden Treasure will immediately identify with the dynamic between Henry and his younger sister. Henry has the traits of a child who is perhaps a little possessive and who is certainly suspicious of Lucy’s place in the family. Lucy is a lot more enigmatic throughout the story, but her own qualities end up challenging Henry’s perceptions. There are a number of morals that can be highlighted in the story. Henry’s possessiveness with his ‘treasure’ not only examines his exclusive approach to playing, but has a valuable lesson in listening to parental advice. His suspicion of Lucy also challenges his ideas of what it is to have a little sister, and what it means to be the big brother. In addition to this, there are other teaching points in the story, such as the use of ordinal numbers, understanding the broad use of financial institutions, and of course, the power of imagination. The next book coming out is called Titch the Itch. It centres on the idea of friendship and how this can be difficult when you’re an itch. It will be available on November 30 2017. Henry and the Hidden Treasure is an imaginative adventure a young child has in defending his pocket money against his little sister. Henry constructs elaborate defensive measures that he is sure will stand up to the clever ambitions of Lucy. Little does he know, Lucy has a few tricks of her own.With a focus on introducing children to the use of ordinal numbers, Henry and the Hidden Treasure also draws out some important qualities of being a kid – such as creativity, the value of listening to parental advice, and of course, being nice to your sister. Posted on November 25, 2017, in Interviews and tagged adventure, amazon, amazon books, amazon ebook, art, author, author interview, bcr fega, book, book review, books, brother, childrens book, creative, ebook, ebooks, facebook, family, family life, fantasy, fantasy book review, fiction, goodreads, growing up, Henry and the Hidden Treasure, illustration, imagination, interview, kids book, kindle, kindle book, kindle ebook, literature, mystery, novel, parent, picture book, publishing, read, reader, reading, review, reviews, secrets, short stories, siblings, sister, spies, stories, teacher, treasure, twitter, urban fantasy, write, writer, writing, YA, young adult. Bookmark the permalink. Leave a comment.